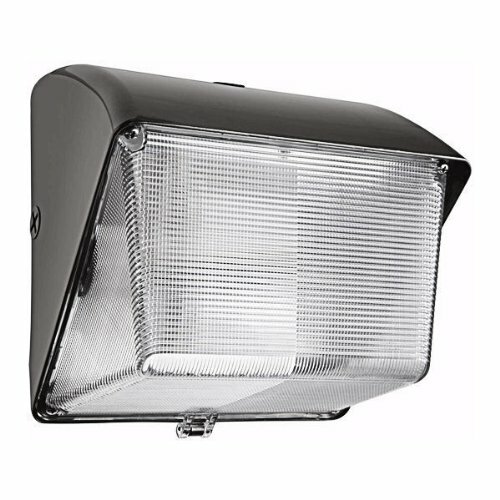 This RAB Lighting WP1H70 metal halide compact Wallpack light fixture is made with a powder-coated die cast aluminum housing for resistance to corrosion, and a prismatic polycarbonate refractor that resists breakage. It provides 5,600 lumens with 70W of power consumption. Its reflector is made of semi-specular anodized aluminum, and its high-temperature silicone gasket remains in place during lamp changes. A drilling template is provided to assist with wall mounting. This metal halide compact light fixture is Underwriters Laboratories (UL) listed as suitable for use in wet environments. It is suitable for a wide range of indoor and outdoor lighting applications.